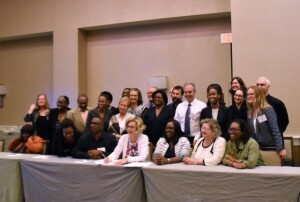 Junior Minister of Public Health, Dr. Karen Cummings (seated third from right) with participants at PEPFAR meeting held recently in Florida. Guyana will later this year embark on a two-year project to reduce the viral load in 90 percent of all persons living with the Human Immuno-deficiency Virus (HIV) that causes AIDS. The United States (US) is providing a US$160,000 grant to help Guyana buy drugs to fight off virus soon after persons are tested positive to reduce their chances of falling ill and dying of AIDS. The Ministry of Public Health announced that the money would be provided from the United States’ President’s Emergency Plan for AIDS Relief (PEPFAR) to help Guyana begin a comprehensive Test and START (Start Anti-Retroviral Therapy) programme. Junior Health Minister, Dr. Karen Cummings says that Guyana will begin START from October 1, 2016. The Public Health Ministry says the aim of the PEPFAR Caribbean Regional Operation Programme is to ensure that 2018, 80 percent of the people living with HIV/AIDS in Guyana are on the Test and Start Programme. “The Government of Guyana recognizes the intrinsic value of the Test and Start programme which will be tremendously effective in the significant reduction in new HIV infections and the fast-tracking of treatment,” the Public Health Ministry said in a statement. Cummings recently participated in the PEPFAR Caribbean Regional Operation Programme meeting held recently in Florida. The Government of Guyana and the Ministry of Public Health say they will continue to work with our international partners to ensure that the Test and Start programme is a success. Test and Start is a scientifically proven HIV prevention programme that can fast-tack the treatment of persons living with HIV/AIDS. The 90–90–90 PEPFAR goals speaks to 90 percent of the people living with HIV/AIDS in Guyana knowing their status. Of those persons, 90 percent must be immediately placed on ARVs. Of the 90 percent placed on ARVs, there must be a 90 percent increase in viral load suppression.